This dazzling exploration of cosmic-folk-rock through Julia Massey & the Five Finger Discount's collaboration just might cause you to hug strangers. "I'm Not Hollow," the new release from Julia Massey and the Five Finger Discount, chronicles the journey of Miss Massey to Ballard and the gelling of a band. With her bandmates Geoff B. Gibbs on bass, Gelli Wuerzner on violin, and Dom "the nizzle" Cortese on drums, Julia has created a fresh fusion of sound. 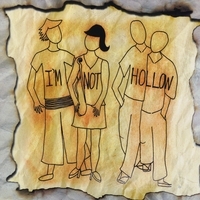 "I'm Not Hollow" combines funk infused indie rock with groovy bass lines and harmonies that highlight each instrument and band member's strengths. This album contains a sound for everyone from the instrumental grooves of "Motorcycle Bong" and my favorite "Catacombs," to the rocking epic of "Fruit Tree." Not to mention the psychedelic folk sound of "Goner." There is definitely something for everyone. The beauty of this album is that this synergy and diversity are arrived at through an organic love of music, sounds, and artistic expression; not through over-production or over-planning. This release reaches the plateau of creating a wall of sound that does not overwhelm, but rather invites the listener to explore the intricate sounds of all the voices and instruments. The combination of Julia's voice, harmonies, and varied instruments and sounds is fresh and new. When combined with the personal, intelligent, thoughtful, and poetic lyrics, you must listen to this album. Again and again and again and again.